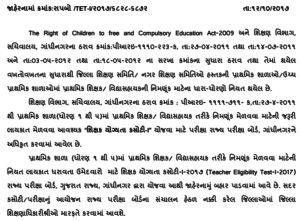 Tet 1 Result has beed declared on result.sebgujarat.com. If you did conduct the examination of tet1 then you can watch result of teacher eligibility test (Exam Date : 4th march 2018). Tet 1 exam was held on 4th march 2018. Now the Result and merit list marks of this examination is declared on result.sebgujarat.com. You can watch your result and marks by clicking on below given google drive link. 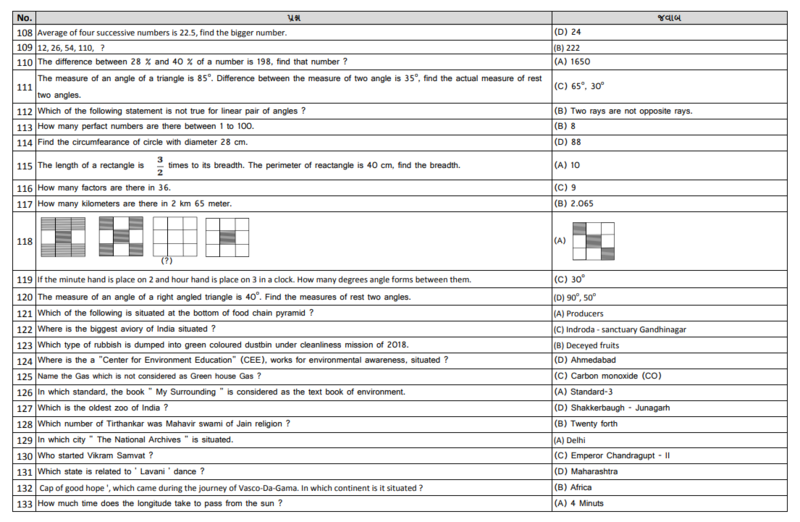 The Tet1 answer key is available in pdf file. We have also uploaded the image of the answer key so that everyone can check that. Now enter roll number/seat number And DOB in boxes then submit it. done! your result will be available there. The official pdf of omr paper solution was publlished in pdf format. 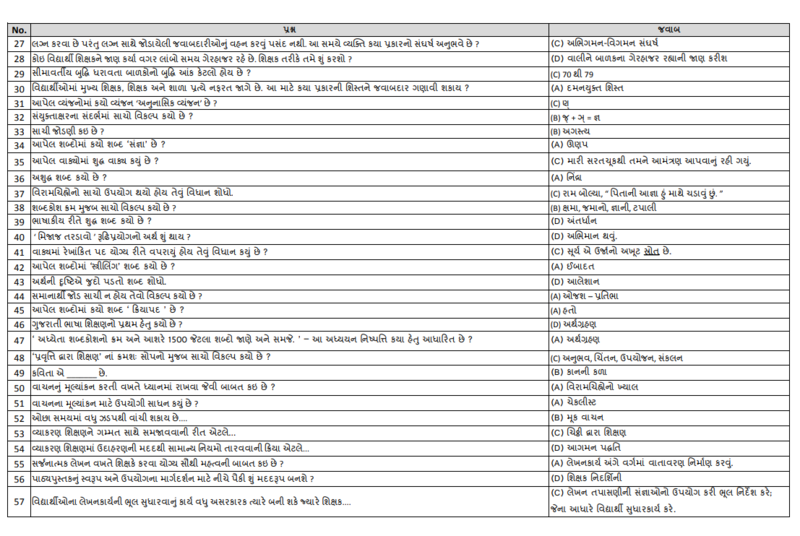 But we have taken picture of it and uploaded the answers here. 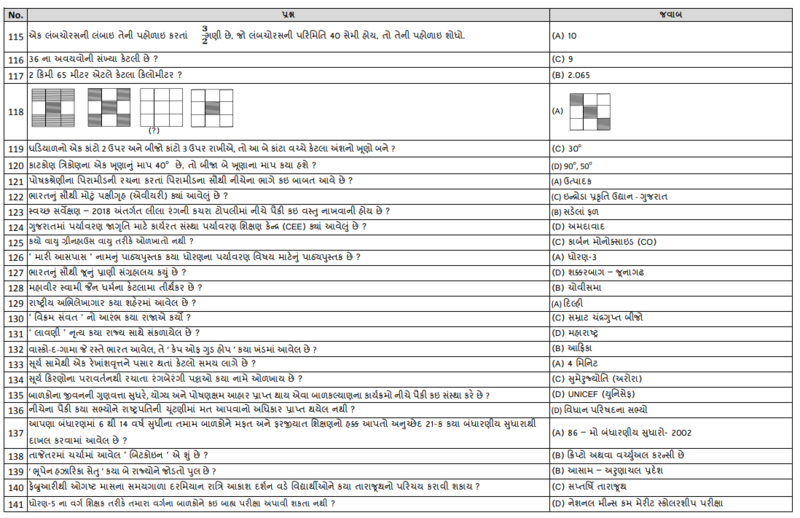 the TET 1 PDF Answer key can be downloadable by below given link. The Tet 1 exam application date, exam date, eligibility, syllabus and the procedures to apply for the exam are given under the subheadings that follow. 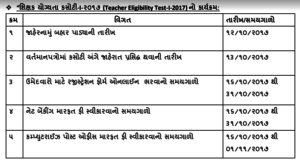 The Gujarat Tet exam date 2018 is given in the advertisement and also put up in all kinds of media like newspapers, government magazines, radio etc. For the awareness of the candidates and there is also a pdf file attached in the vernacular language itself to cater their needs even better. Recent Update (21 February 2018) : New TET 1 Exam date Is published by GSEB. New Exam Date is 4-03-2018 (4th March 2018). Previous Exam Date was 31st December which was cancelled Due to some reasons. This is the latest paripatra published by SEB and it will be live on newspaper from 21st February 2018. Also the cal letter will also be live on from 7-12-2017. If any candidate want to download the call letter then they can read below given guide from here. 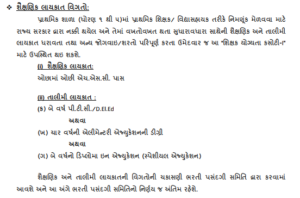 You can download tet 1 call letter from ojas official website ojas.gujarat.gov.in. Just click on exam call letter tab and then select your tet exam subject then enter your confirmation or application number and date of birth. that’s it!. You can download call letter from there. One can either apply via the online procedures or one can even apply via post. The dates for the opening and the closing of the application form online and the last day for applying at the post offices are also mentioned in the advertisement. The pattern of the exam is of MCQ type. The application fee for the TeT 1 exam for the general candidates are about Rs.350 and for that of the OBC and SC/ST, Physically challenged candidates is about Rs. 250 plus the banking charges if one opts for the online application process and post office charges if one opts for the postal application services. The TET exam of GSEB happens in two stages, the TET-1 and TET-2. The TeT 1 is for primary school teachers’ recruitment and the TET-2 is for secondary school teachers’ recruitment. The candidates applying for ojas Tet 1 is expected to hold at least a higher secondary school examination certificate. 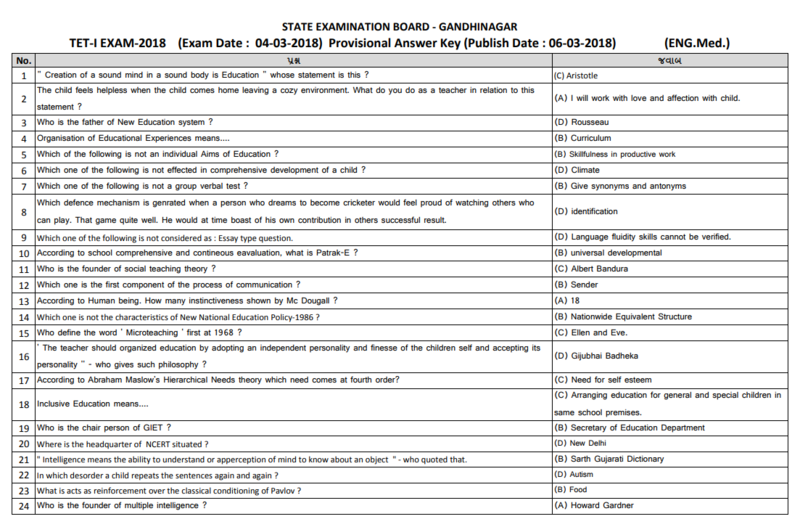 So here is the old question paper of previous year tet 1 examination and probably it will help you to determine the question type and other related information about exam paper. Thank you! 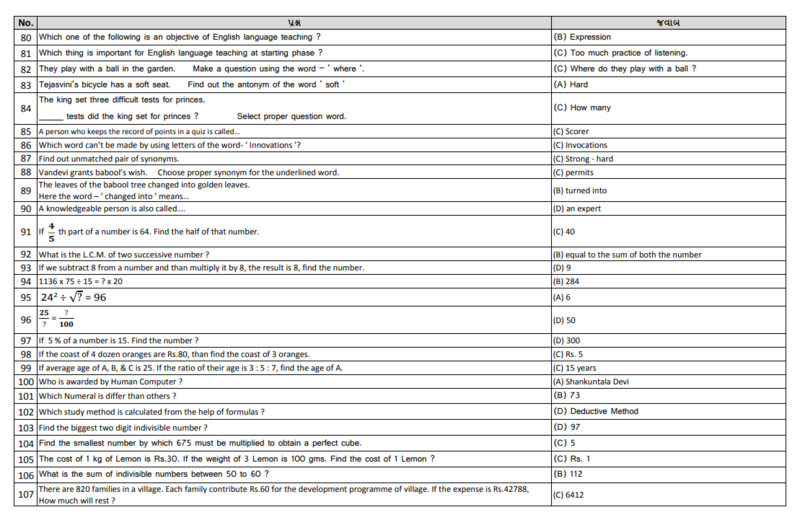 The syllabus of the TET-1 exam tests on the Basic English, science, mathematics and social science. The various topics which are to be covered under each subject are given in detail in the website. There are books which are available in the market that helps one with the preparation. 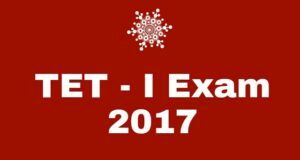 Tet 1 call letter is now available to download for examination of 31st December 2017. 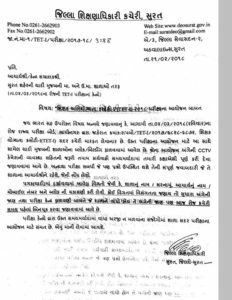 The Stepes to download call letter from the website ojas.gujarat.gov.in is given above so you can download ojas call letter easily. 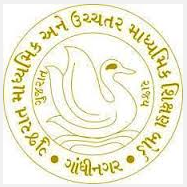 if you are frequent examiner of various jobs and recruitment of Gujarat state then probably you are well aware of ojas website. OJAS TET or TAT ? Some people understands the meaning of this name as Teacher Aptitude test. It means the short form of it is (TAT – Teacher Aptitude Test). But if you read or understands it as Teacher eligibility test then you would write it as (TET – Teacher Eligibility Test). In the official sites you could see the name, they writes TET so the E is stands for Eligibility not for aptitude. 1.6 OJAS TET or TAT ? Kai official news nathi ..
Tet 1 exam date kai 6e? Tet-1 exam date thy che ? call latter kyare nikdase ? Tet 1 exam call later kayare nikil se. please give information about tet-1-2017 exam date and call later detail, if it is changed then display it. Finally date TAT1 EXAM ??? Exam Date Change Thai 6e.To New Date Kai 6e. Hall ticket nathi aavi exam kale 6??? Tet 1 exam ni koy new date avi. When tat 1 exam will held, finally? Recent Update (3rd January 2018) : TET 1 Exam date Is Changed by GSEB. New Exam Date will be published after 1 week. 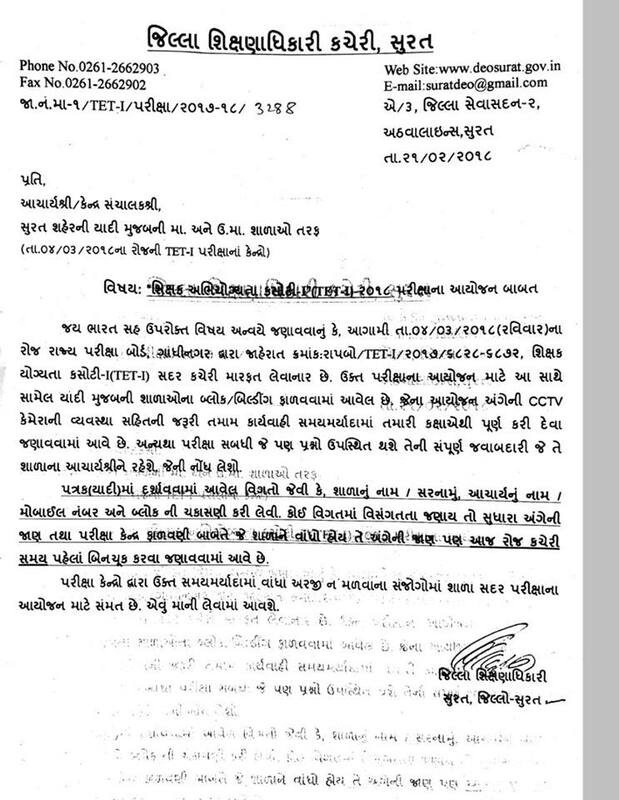 Also the call letter Will be available on the ojas.gujarat.gov.in. Previous Exam Date was 31st December which was cancelled Due to some reasons. When will come the tet – 1 exam date and when will be arranged the exam pls inform us pls, please please please . The Exam Date isn’t Published by gseb so we could not give you the wrong exam date. Thank you sir. 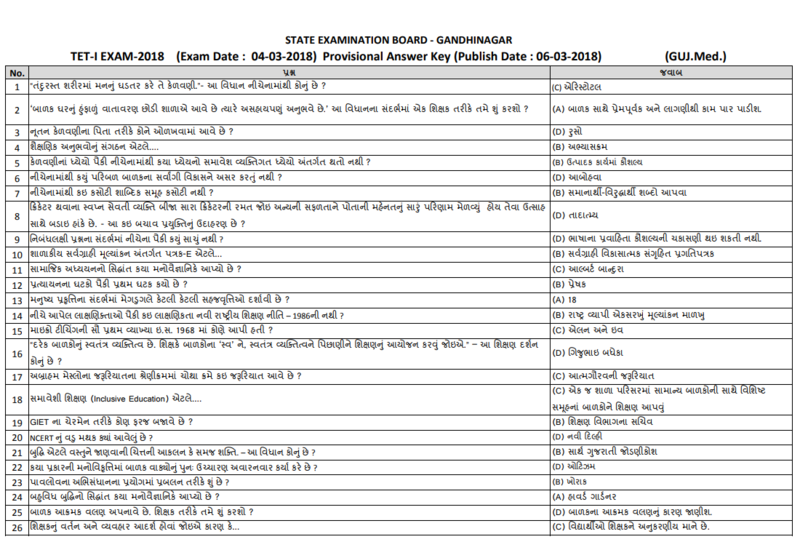 please inform exam date and other notification of tet 1 exam……. Tet 1 ni exame date kyare avase? Dosto tat1 exam kyare chhe? 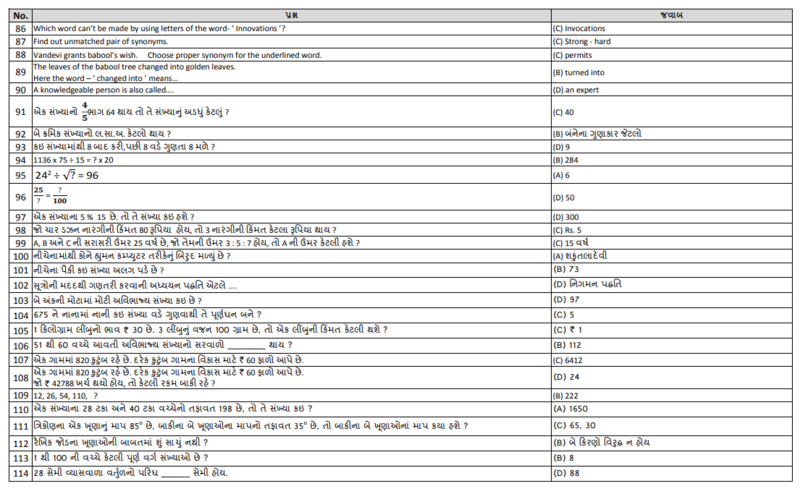 Sir, give us recent update about tet – 1 exam date please. ………………….. Which date to publiced for TET 1 Exam?????? Tet 1 exam kayare 6a. Lage 6e tet 1 exam nahi levay. Arti, there is no announcement from ojas or gserb about tet 1 exam date. Final exam date kyaare che? Pls give the final tet-1 exam date information?? June July ma tet-1 exam avse??? Tet 1 exam ni information a aapo. Sir please inform me about tet and tat exam? Do we get sms alert for exam too? Tet 1 date kai che?